India is also dubbed as the adventure country, thanks to our vast terrain and the tremendous opportunities that we get off the road. The beaten path is where some discover soulfulness, whereas others do it for recreational purposes. With better SUVs available to accomplish this for you, owners are now pushing the boundaries by adding aftermarket products to their dear vehicles. And one of the most important, and also the one that affects the driving manners of a car the most, is a tyre or tyres. The tyres that manufacturers equip are adequate for most of the jobs on the road, but let’s be honest they are not up to the mark of it. So, here’re top 6 SUV tyres that will get you through most of the tricky off-road situations, if need be. We have assorted the ones that don’t compromise on the mileage much, are priced according to their performance and durability. We have listed them in the ascending order of price and capability. 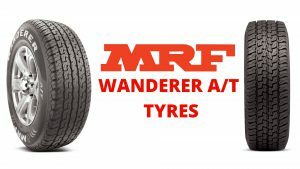 The MRF Wanderer A/T All-Terrain is a pretty popular SUV tyre from the homegrown manufacturer. The tyre is best known for its value for money, which is a mix of durability and off-road performance. The tyre employs a superior tread pattern with a compound material composed of reinforced steel and N66 ply for added strength. Its staggered groves on the tread offer a praiseworthy off-road performance, whereas a multilayered high modulus carcass along with strong sidewall ensures that it has enhanced endurance capability off-road. 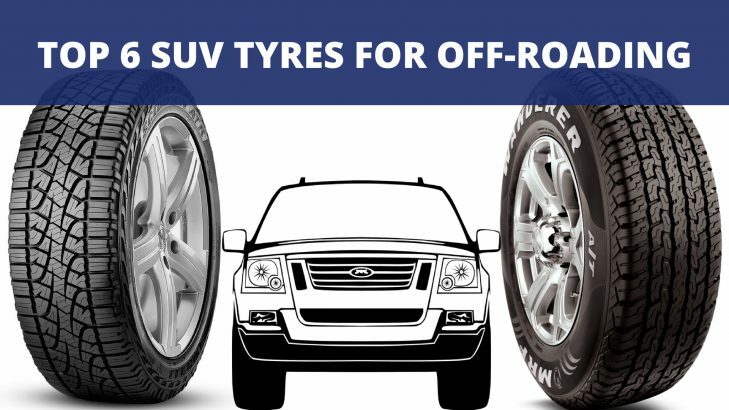 The tyre is available for a long list of wheel sizes (From R 15 to R 18) and hence is available for a variety of SUVs. Despite a lucrative price the Wanderer A/T All-Terrain is recommended for mild off-road activities. The closely packed tread blocks tend to incline towards a better on-road performance than off-road. Price Bracket: Rs 4,900 to Rs 10,000 approx. 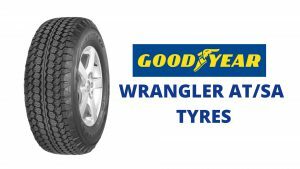 Next on the list is the Goodyear Wrangler and is ideal for mild off-road use just as the Wanderer. However, it will give you a significantly better performance on and off the road, while lasting much longer than its close competitors. All of this is achieved while being very affordable as it is just marginally pricey than the MRF Wanderer A/T. The Wrangler AT/SA achieves superior grip levels with the help of an open intermediate-staggered grove pattern. Visually, the pattern is quite similar to that of MRF, but when you observe closely you’ll notice a marginally bigger spacing between the tread blocks. This translates to a grippy tyre while off-roading. The compound integrates a group of high strength radial ply to achieve superior load bearing and better resistance to wear and tear while off road. Because of the increased space between the blocks, the tyre does tend to make some noise while driving on clean tarmac. Additionally, the tyre is available with plenty of tyre sizes ranging from R 15 to R 17. However, its size options lag behind when compared to the extensive sizes available with rival brands. 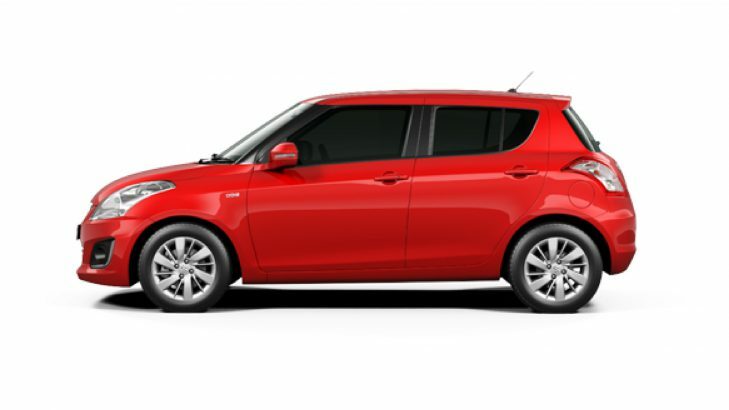 Additionally, a standard warranty of five years is on offer, which is very impressive. Price Bracket: Rs 5,000 to Rs 10,800 approx. Taking the notch a bit higher is the all-new Geolandar A/T G015. The tyre is bestowed with a superior tread pattern with an aggressive shoulder block to shrug off even huge lumps of wet mud. Not only this, the tyre is an equally capable performer on snow, sand, rocks and gravel. The four deep grooves on the tread allow better water expulsion. Whereas, a triple polymer-silica compound with orange oil ensures superior tread grip. The tyre also promises better road holding capabilities and durability. Under normal use, the tyre can last as much as 50,000 km. Although, the Geolander promises a better mileage, but that is slightly lesser than the fuel efficiency returned by the Wanderer and the Wrangler. Clearly, the tyre sacrifices a bit of mileage for the off-road performance it offers. 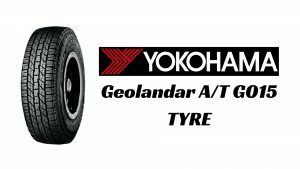 Unlike the Goodyear Wrangler AT/SA, the Yokohama is available with a very wide range of tyre sizes almost equal to that of the Wanderer. One can choose from as small as 15-inch to as big as 18-inch wheel sizes. Price bracket: Rs 5,500 to Rs 16,000 approx. 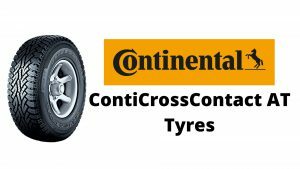 Another premium tyre in this segment is the ContiCrossContact AT. The converging tread pattern design helps cut tyre noise on the road, whereas the same design offers a superior off-road grip. This special design is also helpful in water dispersion; high-speed direction changes on an off-road terrain and also provides better braking performance. On the flip side, the tyre loses out on fuel efficiency but is quite durable in the long run. In India, it is available with 15-inch, 16-inch and 17-inch size choices. Price Bracket: Rs 5,111 to Rs 13,500 approx. 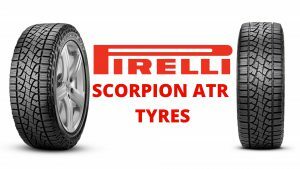 One of the top tyre manufacturers of the world, Pirelli, also has its popular off-road tyre to offer. The Scorpion ATR has been quite popular for offering an exceptional amalgamation of on and off-road performance. Thanks to an advanced tread pattern and the cutting edge compound technology, the Scorpion ATR makes sure that the ride is comfortable with minimum tyre noise. The curved central grooves offer continuous traction off-road; while the strong sidewalls make sure the tyre stays sturdy in bumpy situations. However, the tread pattern has enough capability to surprise you off-road as well. The tyre maintains an equal level of performance on snow, mud, sand, gravel and tarmac. It also meets superior durability standards and also helps the vehicle to achieve its maximum fuel efficiency figure. On the downside, the tyre is only available in 16 and 17-inch wheel sizes, but the company may expand the size range in the coming days. A standard warranty of 4 years is offered by the manufacturer. Price Bracket: Rs 7,850 to Rs 10,222 approx. When it comes to the LTX Force and the Scorpion ATR, it is a very close battle. Although, the grip offered by the LTX Force is marginally better than the Scorpion ATR. But its durability is hands down and beats the ATR or any other tyre in this category. 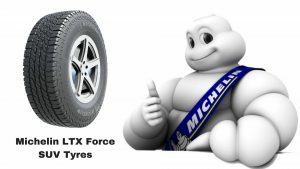 Yes, the tyre is one of the most expensive in the segment, however, 35 percent more durability (as tested by Michelin) ensures peace of mind for a longer period. And, then comes the rally-derived performance, which will impress you when it comes to high-speed off-road maneuvering or during crawling up steep slopes. This is just an example, but you can expect the LTX to offer superior grip on all kinds of off-road situations. The tyre is available in 15, 16, and 17-inch sizes and is offered with a standard warranty of three years. Price Bracket: Rs 8,780 to Rs 13,500 approx.